This "3-in-1" chair has three use modes: high chair, booster and toddler chair, for ages 6 months to 5 years. It doesn't fold, but its footprint is small. 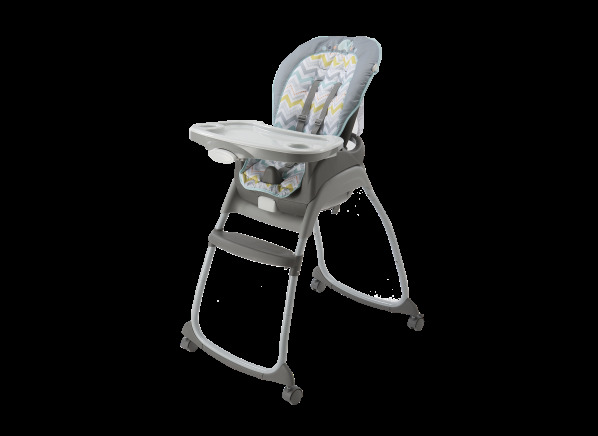 The Ingenuity Trio 3-in-1 is part of the High chair test program at Consumer Reports. In our lab tests, High chair models like the Trio 3-in-1 are rated on multiple criteria, such as those listed below. Safety: Safety for each high chair was assessed by our testing, which is based on the currently-voluntary safety standard, ASTM F404-16. Tests include evaluations of the restraint system, stability of the high chair, and static and dynamic load assessments as well as other tests. Ease of use: Ease of use is based on trained panelists' assessments of harness adjustment and use, folding and unfolding, removing and replacing the tray and tray insert (if any), adjusting seat back and height where applicable, removing and replacing the seat cover. Ease of cleaning: Ease of cleaning reflects how easy or difficult it was to clean the high chair, taking into account the configuration and materials used in the chair frame, seat, seat pad, tray and tray insert, if any. Easiest-to-clean surfaces should be smooth with minimal seams or crevices to collect gunk. Seat pads, if present, should be machine washable and/or easy to clean effectively with a damp cloth or sponge. Weight (lbs.) Weight Weight is the weight of the chair (with tray in place) in pounds. Footprint Footprint Footprint is the amount of floor space a high chair will take up. Small is 600 square inches or less. Medium is 601 to 719 square inches. Large is 720 square inches and up. One-hand tray removal One-hand tray removal Being able to remove the high chair tray easily, with one hand, is a great feature. It allows you to keep the other hand free to tend to your baby. Reclinable seat/positions Reclinable seat/positions Reclinable seat/positions indicates whether or not the chair has a reclinable seatback, and if so, how many positions are available. Adjustable seat height/positions Adjustable seat height/positions Adjustable seat height/positions indicates whether or not the chair's seat height is adjustable, and, if so, the number of positions available. Harness type Harness type Harness type is 5-point, incorporating shoulder as well as waist and crotch straps - which we strongly recommend - or 3-point. Projected footprint (sq. in.) Projected footprint Projected footprint is the amount of floor space, in square inches, that the chair requires while in use. How to clean seat pad How to clean seat pad The manufacturer's instructions for cleaning the high chair's seat pad. (Most frames are cleaned simply by wiping with a mild cleaning solution and sponge or cloth.) Some seat pads are machine washable, others are hand wash, and some just wipe-clean with the aforementioned mild cleaning solution and cloth. Converts to toddler/youth chair Converts to toddler/youth chair Some high chairs can be converted to toddler or "youth" chairs. The weight limit for each chair indicates how large a child - or, for some models, a young adult - can be accommodated.